Welcome to December Daily® 2017 | Day 18. 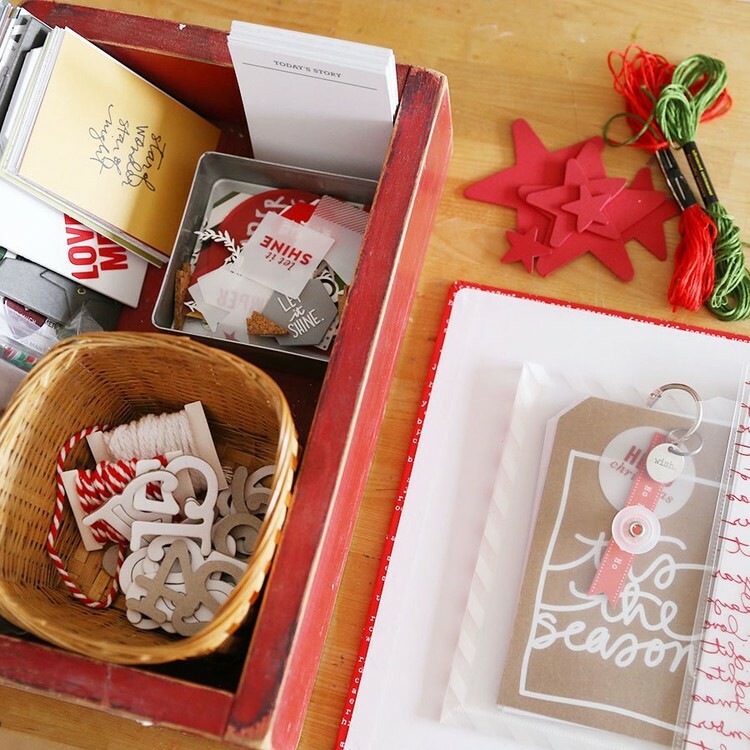 Today I'm sharing a story about Anna working on her December Daily® Kids Album. I had been waiting for some time when both girls would be here for them to play with them together but plans changed and Audrey's with her Grandparents for much of this week. 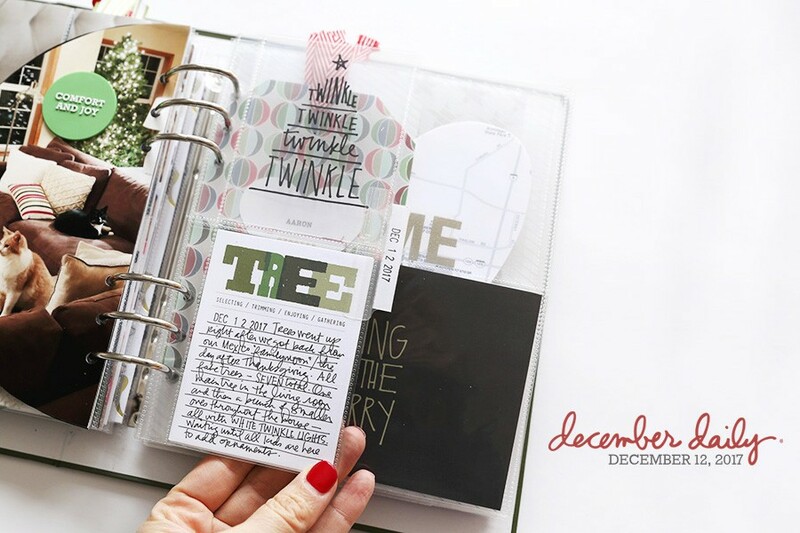 For this story I ended up creating a flip-out using 1/2 of a 6 inch x 8 inch photo and a journaling card from the December Daily® Log Book. It's a fun way to play around with photo enlargements and still include a story. My 6 inch x 8 inch photo was printed on my Canon Pixma MG7720. I cut it in half and then used washi tape and pattern paper on the inside to create a page that opens. See the video below for full details. To create a "tab" along the edge I used one of the chipboard circles on the outside and one of the gold-foil circles on the inside. Super easy way to designate a fold-out page. Don't miss out on my 12 Days Of Giving over on Pinterest. Today is Day Seven of twelve digital holiday quote downloads. The two pins and downloads are now live and the others will activate over the next few days at 12:01PM EST. All digitals will remain FREE and available for download until 11:59pm ET on 12/31/17. How fun! Anna has beautiful handwriting like you Ali. Thank you so much for the daily videos! I'm getting lots of great ideas. Merry Christmas to you and your family! Your creativity never ceases to amaze me. Another gorgeous page, love it!! So fun to see Anna crafting too. Nandini is very serious about her “book of Christmas” and I love sitting down with her to do our pages. I am so happy about this kids kit! It is a dream come true. what punch is that ? I have a cropadile punch but even the biggest one on it seems to small for my holes. Enjoying the videos, thank you! Quick unrelated question -- now that you are doing the monthly stories kit, do you still plan to do the seasonal shop releases this year? O.M.Jittles ... definitely "scraplifting" this technique for "hiding" journal writing or even additional photos, etc... Your pages are always so beautiful! THANK-YOU for doing a daily video with each of posts. I realize it's time consuming, but so appreciated and wonderful "gift" to all of who read your blog regularly. I didn't see this uploaded to You Tube. I usually sit down with my morning coffee and check out your latest December Daily video - so nice to enjoy it on the big screen. Thanks for letting me know! Getting it set up over there now.